Posted on March 1, 2017 at 12:31 am. Overview: Centrally located in the Las Condes municipality, Juan Pablo II Park required pathway lighting that would improve safety, enhance security, and extend park hours for the community to rest, exercise, and play in a serene natural setting. In addition, the municipality also wanted to be a leader in the country by adding renewable technologies to its infrastructure. Project: As the authorized Carmanah partner for the Chilean region, electrical engineering company Emelta proposed Carmanah EverGEN 30 solar LED lighting as a possible solution. These lights offered compact, integrated design: the batteries, energy management system, and solar panel were housed in one unit at the top of the pole, providing a pleasing design aesthetic while also reducing the system’s susceptibility to vandalism. Additionally, the system came with a proven track record for reliability: Carmanah lighting has performed in challenging, harsh conditions around the world. Since Las Condes was looking to be a leader in Chile for renewable technology, it needed to look the part by using outdoor lighting that could blend seamlessly into the natural environment. 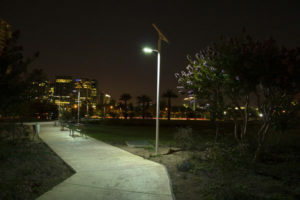 The light uniformity Carmanah could provide allowed for wider spacing between poles—meaning fewer units than other solar outdoor lighting options. The focused output provided light only where it was needed on the path to help the municipality reduce light pollution. We knew Las Condes was looking to install solar LED lighting in the park and we felt strongly that the Carmanah EverGEN was the right solution. Once our client saw the integrated form factor, the proven performance of the EverGEN, and the strong reputation of Carmanah products, they agreed.” – Carlos Hornauer, Director for Emelta S.A.